I have already made a 1/72nd F-16B in Israeli colours. It is a Hobbyboss kit and was the first successful plane I finished in about 12 months. 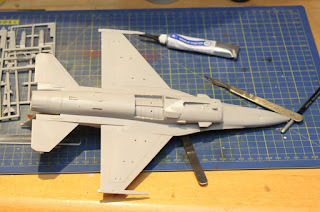 I am now working on an F-16I Sufa - Hasgawa 1/48th Scale. 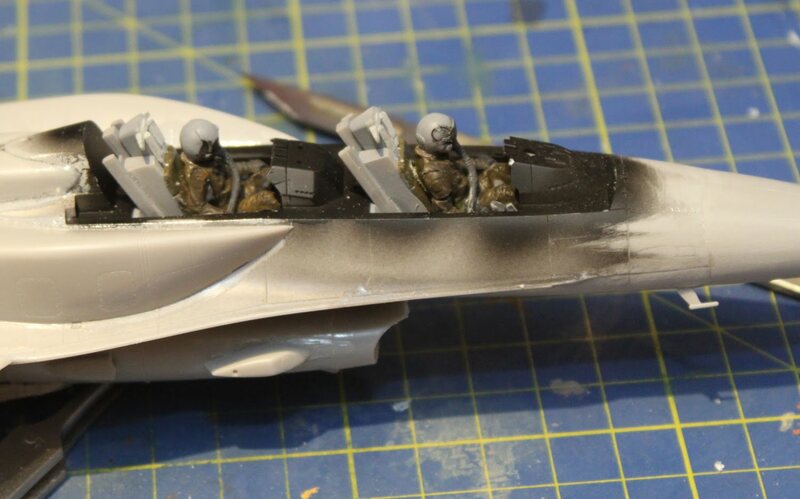 I did intend to do it with the canopy closed with the two figures in their seats. However, I have masked the canopy and then tried to seat it down but it won't sit right so I am thinking that the heads of the figures are stopping it coming as low as it needs. As the canopy is masked, I can't see what is going on! Mind you, you can't see much in the cockpit with the figures in place so I don't think it will make much difference if I have it open or closed. Let's see how we get on. The filler on the underneath is where there is a moulded area that isn't on a Sufa. You get a standard F-16 from Hasegawa then a bag full of new sprues which contain the conformal fuel tanks and all of the extra bits a Sufa has. Sometimes you are drilling new holes and sometimes you are filling in holes. So far I am doing alright with this one. I am enjoying it and haven't yet made any stupid mistakes. I narrowly avoided one when I stuck the nose on, having forgotten to add the weight, but I caught that in time. Current disaster - there is always one - when taking the photo of the F-16B, I put my camera down and because it was off balance with the flash gun on top, it toppled off the work top. The flash gun has broken off and the foot that is gripped by the camera to hold the gun on has broken! I tried Plastic weld, which will stick most plastics but that didn't work. I am now trying super glue but think it may crack under the strain. If that happens, then my last real resort is Gator's Grip. Watch this space! To judge my airbrushing skills against the Israeli airforce, check out this photo: now that is some overspray! I have finally completed 2 He162 Salamanders. As one is in Russian Markings and one in Luftwaffe, I thought that they might look good if posed as if they were on display at a Museum. Hence, the setting below and the title. But first - progresss on the Salamander. I got the second one finished but messed up a couple of decals. I then couldn't find the second kit decals so assumed that I had thrown them away. I meant to order an extra kit but forgot! This just shows how unorganised and stupid I am. However, to reinforce that idea, last night I found the decal sheet. So I have now pretty much finished both Salamanders. I have yet to put a second coat of Klear on the Luftwaffe version. This is so that I can use the Pro Modeller wash on the panels lines. If you look at the Russian one, you can see how well this works. The fuselage of this model is a solid moulding so there is nowhere to put any nose weight. Because they are tail sitters, I intend to put them on a base side by side - maybe as an exhibit and then I can stick the undercarriage down. I am close to finishing two aircraft without me throwing them away - Ta-Ra!!!!! Double click on the picture for a larger image (in a new tab). Now to my best success to date, says me. I have been working on a Young Miniatures 1/10th bust - these must be my favourite topic for modelling. 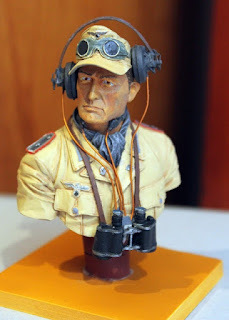 It is a Deutsche Afrika Korps radio operator. When I received it, I thought that it would be consigned to the - do it later - bin because of the compexities of the heasdset - especially the etched brass details which were tiny. I have a rule that says if etched brass is tiny the I don't try it. I thus decided that I would make him without the headset - a real copp out - but the realsied that they hadn't moulded one ear as it is inside the headset pad and that they had moulded the throat mike. So, I had to do this. Amazingly I managed it. I am very proud of this one and feel that I have finally got a good face. Also, the jacket really looks as though he has been in the desert for some time. As always, blowing the figure picture up so you can see it makes it look less detailed than it looks in real life but I hope you enjoy this image. Well, I have to finish off the two He162s and put them on a base. Then, I have three new projects. 1. 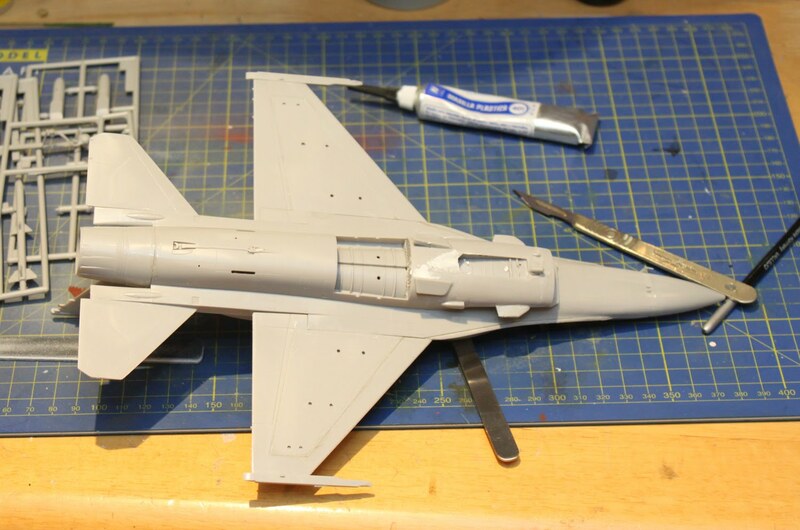 Currently underway - Hasegawa F-16 in Israeli colours in 1/48th. 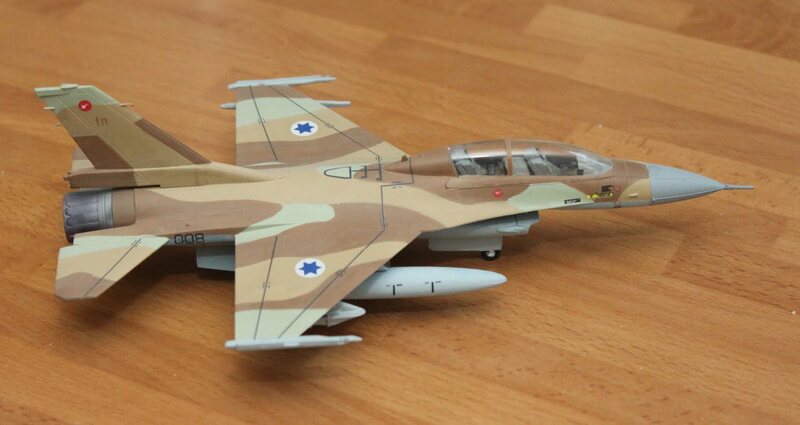 I just love the look of these planes in the four colours that the Israelis use. I have done one in 1/72 so this will make a pair. 3. Young Miniatures - The Black Devil The Soviet Naval Infantry in WWII - a Soviet sailor with a bandioler of shells around his neck. Firstly, I have had some kind comments about my Cutlass disaster. It has determined me to acquire another kit and to finish it off as intended. Unfortunately, the kit is currently out of stock so it will have to wait a while. In the meantime, I have moved on to more aircraft trouble. Determined to kill this problem, I am getting further and further down the simplicity stakes. 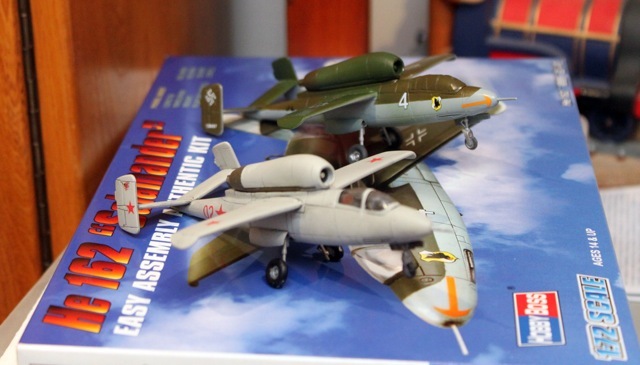 As we were taking an extra day's holiday over the Bank Holiday weekend, I took a Hobby Boss HE162 Salamander home, knowing that there was a Russian option in the box which was all over light grey. There was me thinking, this will be easy. So, this is how it coes. I get the model put together fine. I was wondering a bit about it being a tail sitter but as the body is cast in one limp of plastic, there is nowhere to put any weight anyway. I get it painted and the canopy masked up. So far so good. Now we come to decalling. I HATE decalling with a passion. I find it the most tedious activity known to man, at least in the modelling world. This always makes the process a bit suspect. Firstly, I messed up one red star so that loeft me leaving off the marking on the underside of the wing as I had to use one of those for the top wing. Then I found that a marking on the tail had folded so it wouldn't settle properly. I assumed that nobody would know what it was and you can only see one side at a time so I left it as it was - the pattern was indicernable in any case. I cambe back next day to find that the 02 on one side had moved out of alignment. Back to the shop (thank goodness, I can open up when I want to - this was Bank Holiday Monday). I knew I had a second He162 on the shelf so I brought that home, thinking that I could make a pair, the second one in Luftwaffe markings and I could steal the Russian ones from this kit. Needless to say, I didn't take any paints, and as I don't do Luftwaffe, I don't have a collection of RLMs at home. On went the final decals and from then on everything didn't go too badly. Gloss varnish, a couat of Pro Modeller Black Wash - my last attempt at doing panel lines - and then a coat of matt varnish. It was then that I noticed the one of the small decals on the tail(remember that one was on incorrectly) had come off in the burnishing stage of the panel line operation - needless to say, it was the good one that came off. Still I have a second set of Russian decals so I can fix that. Back to the Luftwaffe version. I had cause to go back to the shop on Tuesday so determined to pick up the paints then. I forgot the paint list! So, I took one of each off the Vallejo Model Air rack, thinking that I can put the ones back that I don't need. BTW, did I jmention that it turned out to be a tail sitter - hence the support from a pipette ion all the photoes. Oh, and I also forgot to mention that I broke the front protruberabce 9don't know what it is called) off during the panel line episode, so I had to drill a hole and make a replacement! All this, and I still have the Luftwaffe version to make! Just to show I have some skills, I also attach a photo of the state of play with a Young Miniatures figure that I am painting. This is a DAK radio officer. 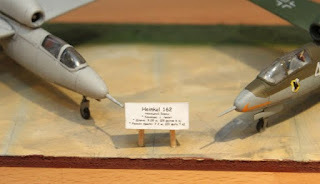 Somehow, I think I am better at figures than I am aircrat, in spite of making aircraft since I was 14.